I saw this movie a week ago, then took students on Friday. Here's my handout if anyone's interested in how the whole sub-prime mortgage crisis happened. There are current news links at the very very bottom. 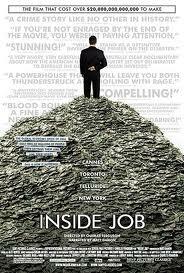 A film exposing the truth behind the economic crisis of 2008. In a nutshell, progressive deregulation of the financial sector since the 1980s gave rise to an increasingly criminal industry, whose “innovations” have produced a succession of financial crises. Each crisis is worse than the last, yet few people are being sent to prison despite fraud that caused trillions of dollars in losses. – Bankers earned salaries in line with other professionals; tightly regulated financial sector. It’s illegal to speculate (make risky investments to make a higher return) with depositors’ savings. Traditionally partners in banks would put up their own money to make money. - Banks were allowed to go public meaning people not in the bank could hold shares (make money from the bank transactions). Bankers were allowed to make risky investments with depositors’ money. - Savings and Loan Crisis – 1st major crisis - people lost their life savings from their bank’s bad investments. - A few people were arrested. - passed the Gramm-Leach Bliley Act (Citigroup Relief Act) making it legal for banks to merge despite potential losses to customers. - a new law gives the Federal Reserve power to regulate the mortgage industry but Alan Greenspan refuses to enact any regulations on the grounds that it’s unnecessary. - 2000 – Dot-com bubble bursts – 2nd major crisis; players settled for cash and promised to change. - Players keep getting caught committing fraud, accounting scams, laundering money (for Iranian nukes, Pinochet, Mexican drugs, etc. ), overstating their earnings, and evading taxes. - Larry Summers wants regulation of derivatives to be made illegal. - Securitization food chain changes – now people who make loans are no longer at risk if people fail to pay. Bankers used to be careful about who they loaned money to, to prevent losing money themselves. Now they don’t have to worry. They sell loans to investment banks who lump them altogether. If one fails, it’s negligible. But it meant bankers made much riskier loans. Thousands of subprime loans were combined into a group called CDOs. They knew it was dangerous to loan to people who can’t repay. But there were incentives based on the most profitable loans (which were the highest risk of non-repayment). - Bankers started borrowing money to buy loans for CDOs. The more they borrowed, the higher their leverage (% borrowed compared to % owned). - Hank Paulson passed regulation allowing more leverage – so bankers could borrow more and own less. - AIG started selling derivatives and credit default swaps – a system where many people could take out insurance against other people’s risky loans, and they’d all cash in if the loan failed. - 2000-2007 – massive housing and mortgage credit bubble sweeps the U.S.
- 2005-2008 – Goldman Sachs, Morgan Stanley, Deutsche Bank and others use credit default swaps to bet against the same mortgage securities they are selling as safe based on questionable ratings. - People warned the public and the bankers: Rajan in 2005, Roubini in 2006, Sloan in 2007, Strauss-Kahn, Akman in 2007, Morris in 2008. Bankers were told over and over, but wouldn’t change anything. - The market for CDOs collapsed. Lagarde told Paulson it was like he’s watching a tsunami, and he’s worried about what to wear. - Companies had AAA ratings as they were going bankrupt. - 6 million foreclosures in the U.S. – estimate another 9 million will lose homes in the next year. - Many people who destroyed their own companies got bonuses instead of being fired. - Bankers still fight any move to regulate. - Financial services have too much influence over government lobbying cheques and political contributions. Some economics profs are getting the bulk of their salaries from doing consulting work for governments or financial organizations. Is it a conflict of interest when they write papers on finance or teach classes when they’re paid to promote certain questionable (illegal) economic practices (similar to a doctor writing about a drug when he’s being paid by the drug company)? There’s no policy to disclose financial conflicts. - Inequality of wealth is higher in the US than any other country. - Obama resisted regulation even as other countries took action. Many governments asked the G20 to impose regulations. Done in Europe now. Nothing done in the U.S. It’s all still seen as a temporary blip. - Spitzer was forced to resign for being a client with a high-profile prostitution ring. Donald Regan – On Wall Street during Reaganomics. Alan Greenspan – Private advisor. Former Chairman of the Federal Reserve since the savings and loan scandal. He assured the public there was no problem with the banks. Bush and sold his stock, he didn’t have to pay taxes on the income. John Paulson – Hedge Fund Manager, sold securities he bet against, knew they were junk even though they were rated AAA. Timothy Geithner – President of the Federal Reserve, Treasury Secretary. Ben Bernanke – Chairman of the Federal Reserve, “We never see house prices go down.” Didn’t admit to a problem until March 2009. Frederic Mishkin – American economist and professor at Columbia Business School member of board at Federal Reserve to 2008; paid to write praising report on Iceland’s finances. ; said “I don’t know the details… I can’t remember…” when questioned about the crisis. The Opposition – People trying to stop the scams. Sigridur Benediktsdottir – Yale economics lecturer – Part of the special investigation commission analyzing causes of Iceland’s financial crisis. Blames the rating agencies. George Soros – Currency speculator, philanthropist, political activist – used an oil-tanker analogy to explain how the market should work; the market is unstable and must be compartmentalized to prevent huge crises. Robert Gnaizda – Former President of Greenlining Institute in Berkeley; advocates of social justice for over 40 years. Points out it was illegal for banks to merge at risk to depositors. Williem Buiter – Citigroup economist, professor of European Political Economy; says banks did it because they knew they’d be bailed out. Eliot Spitzer – lawyer, former Governor of NY, former Attorney who initiated major lawsuits against major U.S. investment banks alleging fraud. Banks don’t create anything, don’t have a product to sell, and shouldn’t be making fortunes just moving money around. Andrew Sheng – Chief Advisor to the China Banking Regulatory Commission General – said they brains behind the cold war moved into finance and are making different weapons of mass destruction. Andrew Lo – Harris & Harris Group professor of Finance at MIT – Points out that people didn’t take this seriously enough. Discussed the study with people getting money as a prize – like cocaine. Joseph St. Denis – Resigned from AIG after trying to alert them to problems with the system. William Ackman – CEO of Pershing Square Capital Management; an activist investor who wrote Who Is Holding the Bag? – one of the first warnings about the impending crisis (2007); said the rating agencies gave high ratings because they were paid to by the investment banks. Dominique Strauss-Kahn – French economist, Director of the IMF. Said when people were afraid, they told him they need to be regulated. Once the solution was in sight, they changed their minds. * Why should a financial engineer be paid 100 times a real engineer? A real engineer builds bridges. A financial engineer builds dreams. Also Spitzer commented on the fact that we can't compare electronic technology rise in millions and the bank's rise, because tech is actually creating something - the banks are just moving money around. 1. What are your views about the role of government in the markets? 2. Why do banks traditionally require a down-payment on a home mortgage loan? 3. Why would a bank make a sub-prime loan if they think the loan will fail? 4. Whose fault is this? What should they have done differently? 5. Would you make that bet? Would you sacrifice millions of people’s savings for millions of dollars without risk of punishment? 6. How can the financial sector turn their backs on the very people they’re supposed to serve? How can that practice be maintained? 7. Eliot Spitzer was made to resign from politics because of his involvement with a prostitute. Many high-finance players are involved with prostitutes and invoice them as company expenses, yet they’re never charged. Why? 8. Should anyone go to jail for this? Explain. 9. Should there be a policy regarding conflicts of interest in education? If Sony Pictures paid me to show you this movie, should I have to tell you that? 10. What’s different about the crash of 1929 and the crisis of 2008? 11. To what extent was Greenspan right about the benefits of the free market (de-regulation)? 12. How can this situation be stopped when the most powerful people in the U.S. don’t want it stopped? What kind of fighting needs to happen to make a difference? 13. Obama said, “What is required of us now is a new era of responsibility – a recognition, on the part of every American…and those of us who manage the public’s dollars will be held to account.” And then he hired all the same players. What happened? ABS – Asset Backed Security – a financial security backed by a loan; other than a mortgage; eg. Credit card debt, etc. CDO - Collateralized Debt Obligation – a type of ABS whose value and payments are from a portfolio of fixed income underlying assets. They’re split into different risk classes. Each CDO is made up of hundreds of individual residential mortgages. CDOs that contain subprime mortgages are at the greatest risk of default and should have a really low rating. CDS – Credit Default Swap – An insurance contract in which the buyer of the CDS makes payments to the protection seller in exchange for a payoff if a security goes into default. They can make money whenever a loan goes bad. Deregulation – the removal of government rules that constrain the operation of market forces. It began in the Reagan Administration and is also known as Reaganomics. Derivatives – An agreement between two parties that is dependent on a future outcome – a financial contract with a value linked to the expected future price. Derivatives allow risk about the prices of the underlying asset to be transferred from one person to another. Types of derivative are options, futures, and swaps. They don’t have value of their own; their value is derived from another asset. Go public - A corporation goes public when it issues shares of its stock in the open market for the first time, in what is known as an initial public offering (IPO). That means that at least some of the shares will be held by members of the public rather than exclusively by the investors who founded and funded the corporation initially or the current owners or management. Hedge Fund- a portfolio of investments that uses strategies in domestic and international markets with the goal of getting high returns. They’re set up as private investment partnerships that typically require a very large minimum investment. They carry more risk than the overall market. They’re unregulated because they’re used by sophisticated investors who are thought to have more resources in making investment decisions. Leverage – The use of borrowed money to increase the potential return on an investment. It’s the amount of debt used to finance a company’s assets. A company with more debt than equity is considered highly leveraged. It’s risky to use because if the investment fails, the loss is much greater than it would’ve been if the investment had not been leveraged. Money-Market Funds – A mutual fund that invests in short term securities. It’s easily liquefied. MBS – Mortgage Back Securities – Investors in a MBS are essentially lending money to a home buyer or business. It’s a way for a bank to lend mortgages to customers without having to worry about whether the customer has the assets to cover the loan. Ponzi Scheme – An fraudulent operation that pays returns to separate investors from their own money, or money from other investors, rather than from any actual profit earned. It usually offers abnormally high short-term returns. It only works as long as there are new investors. Predatory Lending – The practice of a lender deceptively convincing borrowers to agree to unfair and abusive loan terms, or systematically violating those terms in ways that make it difficult for the borrower to defend against. Security – A negotiable instrument representing financial value. Subprime – Loans to borrowers with a tarnished or limited credit history. They carry more risk but also a higher interest rate.